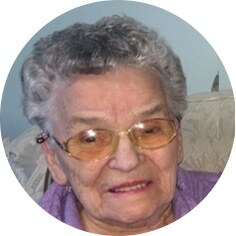 Surrounded by family and friends, Helen Murrine Cooper passed away peacefully at Providence Place in Moose Jaw, SK on Monday, January 28th, 2019 at the age of 98 years. She was predeceased by her husband, Russell in 2000; sisters, Hazel (Ken) Elves, and Evelyn (Art) Torbitt; brothers, Frank (Blanche) Donnelly, and Roland (Vi) Donnelly; as well as numerous extended family members and friends, including Leonard Kyle. Helen will be lovingly remembered by her sister, Addie Hughes; sisters-in-law: Elsie Langhorne, Norma Brown, Joyce Kennedy, Elenor Simmons, and Shirley Boan; children: Linda (Jim) McCracken, Sandra (Wayne) Franklin, Val (Al) Morrissey, and Paul (Tammy) Cooper; grandchildren: Shauna and Will Northgrave, Christine and Steve Boyko, Bethany and Daryl Alards, Joshua Morrissey, Brianna Lackie, Leah and Brendon Palmer, Morgan Cooper, Joel Cooper, Rebecca Friesen, and Tim Hopwood. Numerous great-grandchildren, nieces and nephews also brought joy to her life. Her grandchildren were a special source of pleasure and comfort, and she showered them with unconditional love in return. Helen’s earlier days revolved around family, faith, community, and a deep love of music. She played piano in various bands, including the Bentley Jam Band, school concerts, church and community functions. She also directed choirs, taught piano, and served as organist for many weddings and funerals. Helen was a long standing member of the Chaplin United Church and UCW, Sunday School Superintendent, and Board Chairperson. Helen’s family extends their sincere gratitude for the care and attention she received from the staff of the Bentley, Chateau St Michael, Providence Place, and special friend Audra Zolmer. The Funeral Service will be held on Thursday, January 31st, 2019 at 2:00 p.m. in Moose Jaw Funeral Home. Reverend Fred Mathieson will officiate and interment will take place in Chaplin Cemetery at a later date. Flowers are gratefully declined. As an expression of sympathy, donations in Helen’s name may be made to a charity of one’s choice. Arrangements are entrusted to Moose Jaw Funeral Home, 268 Mulberry Lane. Calvin Gammel, Funeral Director 306-693-4550. Helen was a loving and kind lady. Our sympathies to the family. I have many fond memories of Grandma Cooper, and I am grateful to always hold those and cherish them. One of my favourite memories of Grandma Cooper is the day that mom and Paul got married and she played music for us all. She was exuberant in her joy and laughter, and she welcomed me to the Cooper family with open arms. She was truly a special woman with endless compassionate and so much love to give. I am keeping everyone in my thoughts through this difficult time, knowing we can all support each other through love and kindness. Heaven has gained a musical muse. Her love for music and her endless devotion to sharing her talent brought music into my life as a young girl. Helen’s tireless hours to encourage youth in Chaplin to ‘sing out’ was admirable. During her later years in Chaplin, I could still call on her to accompany the school choir. Farewell Helen and may you continue to conduct choirs of angels! Had the pleasure of working with helen while she was at chateau….what a beautiful soul. She will be missed dearly. My condolences to the family. Auntie Helen was truly an inspiration to all who knew her. We always had delicious meals when visiting the Cooper family and often enjoyed her musical entertainment. Love to you all as you remember Auntie Helen and celebrate her life. Condolences to the family. Helen was a great lady and will be sadly missed. Love from sister-in-law, Norma Brown. I have found memories of our visits with the Coopers at Chaplin and for the warm love and hospitality of Auntie Helen. It was a true blessing to hear her play the piano on many occasions. We pray for special peace and comfort for the Cooper family, extended loved ones and many friends in the days that lie ahead. Our deepest sympathy on the loss of a wonderful lady .